(Phys.org) —A research team that includes a physics professor at Indiana University-Purdue University Indianapolis (IUPUI) has recorded a drastically reduced measurement of the Casimir effect, a fundamental quantum phenomenon experienced between two neutral bodies that exist in a vacuum. "These results build upon our expertise in the measurement of the Casimir effect. At IUPUI, we have the most precise determinations of this interaction," said Decca, one of nine co-authors in the discovery. He also is the director of the graduate program in the Department of Physics at IUPUI and co-director of the Nanoscale Imaging Center. "Based on previous knowledge, the attraction discovered here should not have decreased as much as it did. There was still an attraction measured but not near the levels typically found," Decca said. 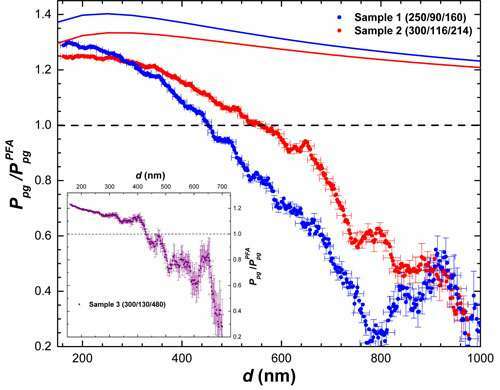 The experimental data, noted by the red and blue lines, show a clear departure from normalized pressure ratings in a typical Casimir force measurement. The observed fluctuations on the experimental data originate from the rolling average. The effect of points far from the mean is extended over the bin where the average is performed. Inset: characteristic results for samples made by sputtering of Au onto hydrogen silesquioxane structures. Credit: Ricardo Decca, Ph.D. He likened the experiment to "going fishing, where we caught a fish nobody ever expected to be there." Co-authors on the study include Vladimir A. Aksyuk, Ph.D., National Institute of Standards and Technology (NIST); Paul S. Davids, Ph.D., Sandia National Laboratories; Diego A.R. Dalvit, Ph.D., Los Alamos National Laboratory; Francesco Intravaia, Ph.D., Los Alamos National Laboratory; Stephan Koev, Ph.D., NIST; Woong Jung, Ph.D., Argonne National Laboratory; Daniel López, Ph.D., Argonne National Laboratory; A. Alec Talin, Ph.D., NIST. Theoretical physicists differ on whether true repulsion (reversal of the attraction from positive to negative) can ever be achieved. However, the study could change scientists' understanding of electromagnetism and lead to the creation of surfaces with less friction. The reduced attraction was measured using a metal-coated sphere attached to an oscillator mounted above two electrodes. 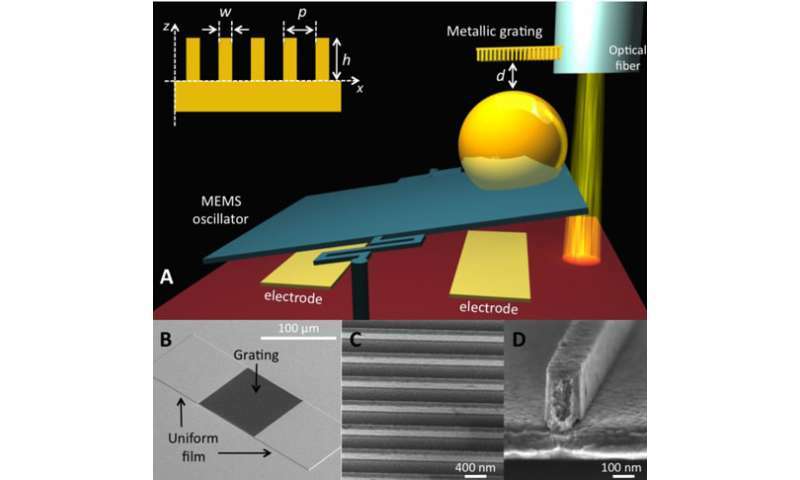 A metallic, nanostructured grating was attached to an optical fiber, and the interaction occurred as the sphere and grating were moved closer to one another. SEE FIGURE. The experiment revealed the Casimir pressure was reduced at more than twice the expected levels when the sphere and the grating surface were separated from one another by up to 500 nanometers. Although excited for the results thus far, the research team noted in the publication that much more analysis and study is needed to determine to true breadth of their impact. The results, however, open up new possibilities in the study of an often-debated phenomenon and could lead to more scientific activity in this field. Theoretical physicists differ on whether true repulsion (reversal of the attraction from positive to negative) can ever be achieved. However, the study could change scientists' understanding of electromagnetism…. Unfortunately nowadays conventional physics in electromagnetism realm still cannot explain why and how charge particles could attract (via different type) and repel (via same type). Understanding the working mechanism below may help the research …. Unfortunately nowadays conventional physics in electromagnetism realm still cannot explain why and how charge particles could attract (via different type) and repel (via same type). Understanding the working mechanism below may help the research …. In that link, in the first line, is a major sign of crackpottery. "Maxwell electromagnetic field theory originally was born with a mechanical model of the aether." That is the first line in the link, and it is completely correct. Maxwell's visual model was mechanical. Not so the generalization. QED is nearing a century of age, and still the trolls think they can get away with claiming that it hasn't been discovered. Tragic troll is tragic. Did they ever measure the variation in efficiency of the oscillator as the Casimir effect was reduced? I would be willing to bet the efficiency increased proportional to the reduction in the Casimir. If the source of the Casimir force is from the natural background of EMR reflecting off the outside of the plates more than the from the space between them, just using a sphere instead of a plate would significantly reduce the attraction. lol, this was submitted by top experts from just about EVERY major national lab; National Institute of Standards and Technology, Sandia National Laboratories, Los Alamos National Laboratory and Argonne National Laboratory. It has also been peer reviewed through Nature. If you think you are going to second guess the experimental setup or the interpretation of the results, then you better bring a bit more to the discussion than a crackpot web link or armchair physics. This is very interesting in terms of nanomaterials, which is a field quietly in the process of exploding. Quite a bit of work in this field is being done by private industry, which is propietary, so you don't hear big press releases about breakthroughs. You just get a car engine that gets 10 mpg more, or a jet engine that runs with half as much noise, or automotive paint that doesn't fade so fast. In so much as Maxwell's equations cannot be applied to situations in either the Planck scale or in relativistic terms, that is correct, though it's difficult to understand what you might mean by "generalization of maxwell's model". Heaviside simply used a type of fourier transform to simplify the calculations when doing practical applications of Maxwell's equations. These approximate answers are not equivalent to the actual solutions for the true field equations. For example, you cannot derive Gauss's law from Heaviside's transforms. Heaviside was also only able to find shortcuts for a portion of Maxwell's equations. Not all of them could be simplified through wave form integrals. Additionally, I don't see what the hell this has to do with Casimir forces. Maxwell's equations do not apply to quantum scale physics any more than General Relativity does. Is inadequate conditions, two objects must have three time gradient, more difficult to establish. Repulsion. An object requires five time gradient in order to produce repulsion, more difficult to control. Such as fish tail the water. A straight line of the three objects, repulsive force is generated on one side, the better measurements.